I'm a huge Joss Whedon fan: he's the creative genius behind Buffy the Vampire Slayer, Firefly, Dr. Horrible's Sing-along Blog and more recently, The Avengers movie. He also works on comic books, writes musicals and oh yeah, he scripted the first Toy Story movie. Joss Whedon is one busy guy and has been for a very long time. One of the reasons I admire him is because he seems to get so much high quality stuff done! I am always in awe of that type of person; How? How do they do it? Recently, Whedon was asked that very question in an article for Co.Create and he admitted that it isn't easy (and that he's burnt himself out a time or two). 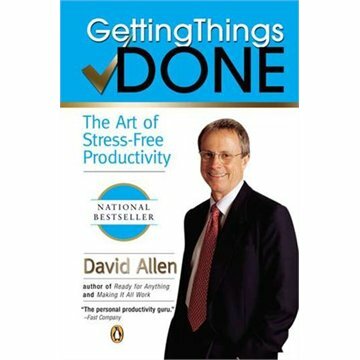 One of the things he found useful, both for time management and remaining relatively stress-free, was a book by David Allen called "Getting Things Done". Well, if it was good enough for Joss Whedon, I figured it was worth the read. Confession: It took me over a month to get the book done. This isn't because it's a difficult read, nor is it particularly long. I just happen to have an incredible aptitude for procrastination. I definitely needed this book. The good news is, once I started reading it, the advice within inspired me to keep reading and GET IT DONE. I've found a lot of the tips and tricks in the book to be reasonable and easily implemented - it's really simple advice that makes you wonder why you didn't think of it before. For example; the Inbox. Do you have one? Get one now. Then, put EVERYTHING in it. Not just things that come from outside sources (bills, orders, faxes, emails etc.) but notes to yourself like; Read Getting Things Done, clean studio, apply for travel grant, take New York art scene by storm, repaint dresser. Allen then goes on to show you what to do with those things in your Inbox. Oh! You thought you already knew what to do with those things? Hmmm, no. It's actually pretty amazing how inefficiently most people (myself included) process the things in their inbox. Bonus: there's a flow chart for this! So on the one hand, a single item on your list just exploded and became a lot longer (and your list might be a lot more detailed than this depending on what shape your studio space is in). On the other hand, you now know exactly what the Next Actions are that you need to do to GET IT DONE. And if you have to postpone your cleaning day, or you get interrupted, you still know exactly what you're doing or where to pick up where you left off. And the best thing is that in the mean time, you don't have to worry about it!